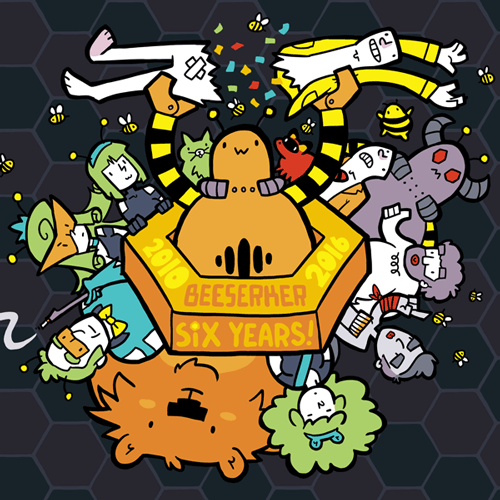 Yesterday marked the sixth anniversary of Beeserker! A big thanks to everybody who’s been a fan the whole time, and a similarly large thanks to all of you who joined in recently and read through six years of back strips to get to this point. Since last update, I uploaded March’s Patreon wallpaper, which is a celebration of the anniversary. It’s available as a high-res download to everybody who’s pledging $1 or more to the Beeserker Patreon. I’ll also remind you that pledging $1+ also gets you all the past bonus wallpapers, which is quite a few now. Oh pewp. I can’t not hear that in the frenchman’s voice from sealab 2021. Oh robot god! you were right, you really did stop using alt-text. Sad day, the one he said he wouldn’t use ’em no more. Does.. does the salve even WORK on metal? It shouldn’t, right? 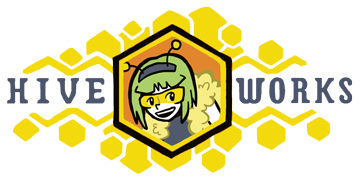 Neither should a giant space bee named Snuh who’s origin confuses me greatly. Congratulations on those six years of comic! By the way, I’m sure that salve ain’t gonna do nothing weird.